Puzzle Pets is a free match 3 puzzle game for Windows 8 and 8.1 from the house of Gameloft. 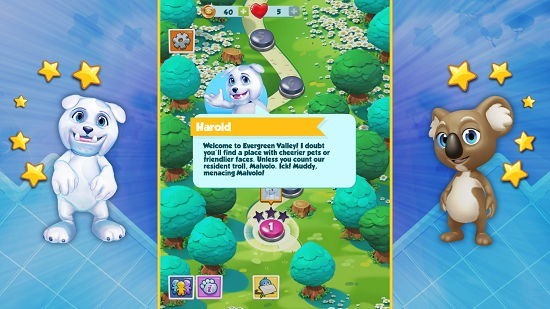 When you launch the game, you will be presented with a cute interface where a talking dog will introduce you to the basics of the game. 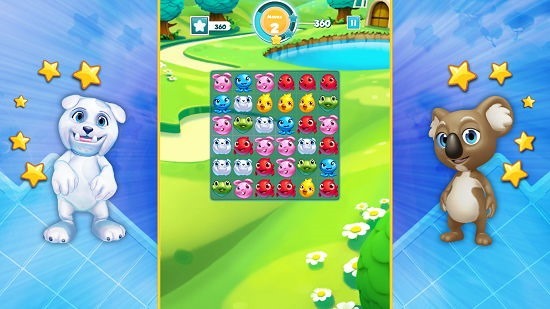 The game is based on matching three or more similar pets together in the grid of the gameplay levels. In the game, initially only the first level in unlocked and over the time, more and more levels get unlocked as you progress through the game and complete the pending levels. The game is a bit on the heavy side, clocking in at about 132 Mb, but the graphics and the ad-free interface more than makeup for this loss. Puzzle Pets is available for free from the Windows App Store. When you run the game on your device, you will be presented with the below interface. As can be seen above, a talking dog Harold will briefly introduce you to the game. The above screen also doubles as a level selection screen where you can click and play the levels which are marked in pink. Clicking on the first level of the game will bring up a brief tutorial of the game. 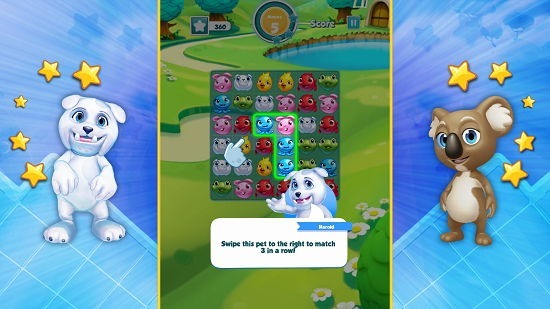 Soon after the tutorial ends, you will be presented with the gameplay screen itself where you have to click and drag pets together to create a match of three or more similar pets on your screen. The gameplay interface resembles the below screenshot. 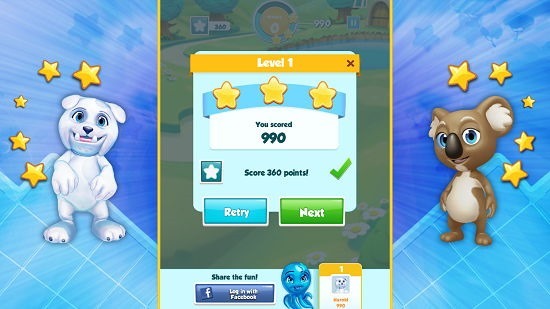 Once the level is complete, you will be shown your score on your screen, in brief. You can choose to restart the level or play the next level from this screen. This basically sums up the main features of Puzzle Pets for Windows 8 and 8.1. Puzzle Pets is a well-designed game indeed for Windows 8 and 8.1. You should definitely give it a look!